OctaneRender RTX | Vulkan - preview release is out! Forums: OctaneRender RTX | Vulkan - preview release is out! 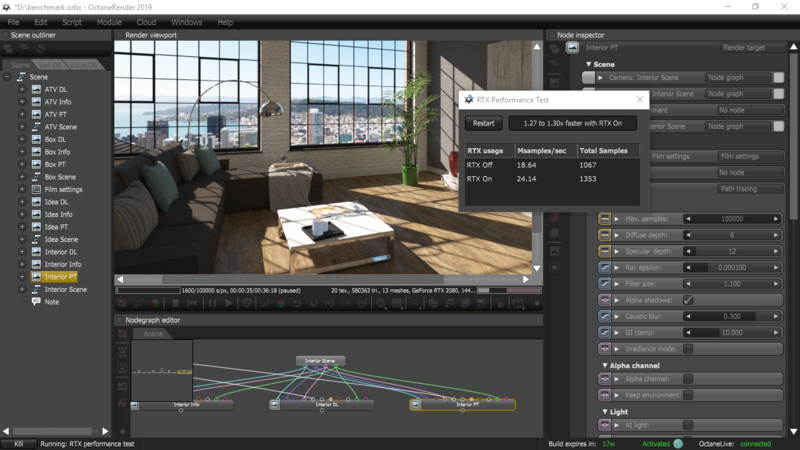 We are pleased to release the first build of OctaneStandalone 2019 with experimental support for ray tracing acceleration hardware using the NVIDIA RTX platform introduced by the new NVIDIA Turing architecture. This release is a follow up to the earlier RTX benchmark which you can also download here. 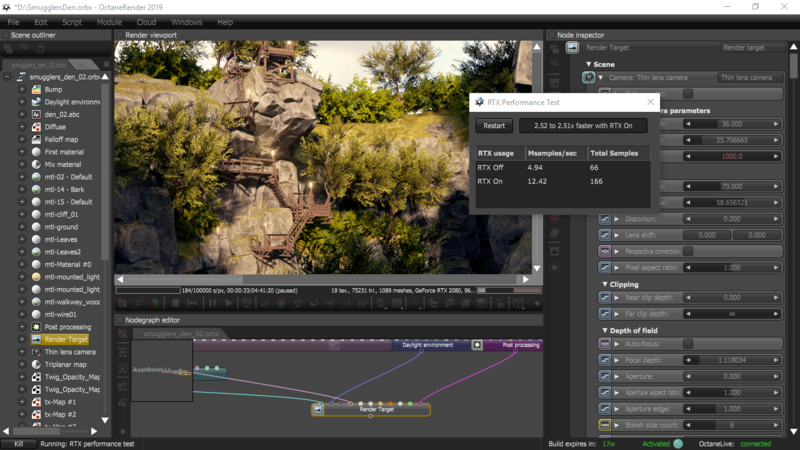 This standalone version comes with a built-in script that allows you to measure the RTX on/off speedup for any render target that you can load in this version of the Octane V7 standalone engine with Vulkan and RTX backend that can be swapped in for CUDA in the device properties. 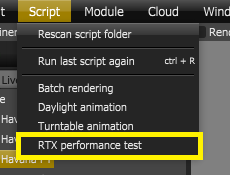 In order to do this, select any render target and go to Script > RTX performance test. A new window will open, just press Start. 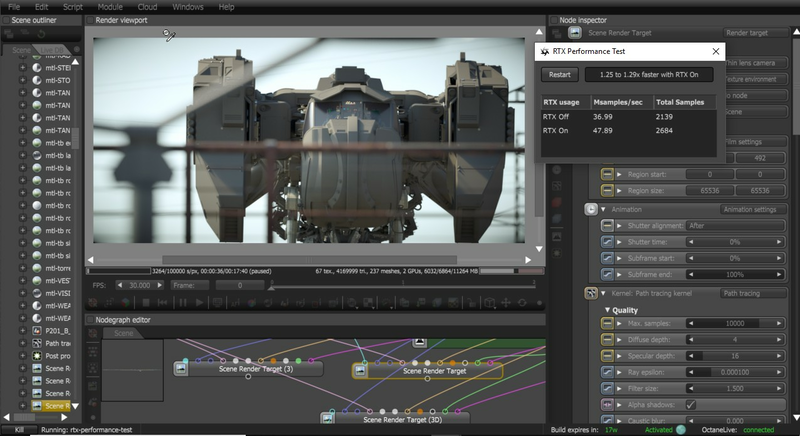 The script will render the render target for about 30 seconds using the both RTX and the regular software backends. Upon finishing you should see your results for both comparing the total collected samples as well as Ms/s ratio (these may can differ depending on the scene and the number of GPUs). 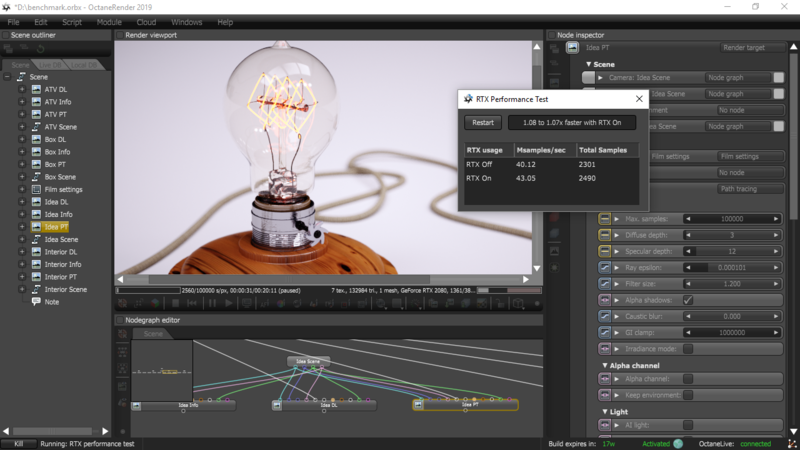 The second value typically estimates the speed for longer render times, and can be higher with complex scenes or multiple GPUs. Below are the results from over a dozen real world test scenes made by our users without any particular consideration for RTX hardware. These scenes show the range of speed gains we are seeing in this build on RTX - from the highest to the lowest. The highest speedup is a mind blowing 7.5x for the Japanese garden scene - which is well known to Octane users - it was the splash screen for Octane 3! Many scenes below, including interiors with full path tracing (24 bounces) are seeing 3x speed ups, which is even better than the benchmark scene we released a few weeks ago (which is about average on this list). 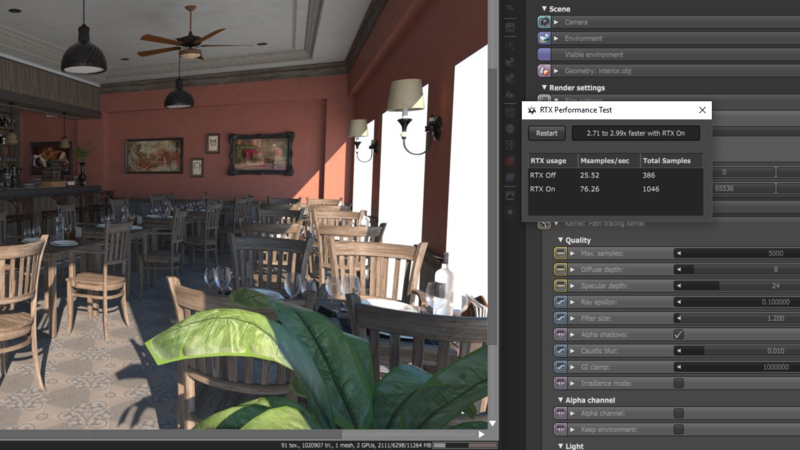 For less geometrically complex scenes, like those from OctaneBench, we see a 1.25-1.4x speedup. The light bulb scene (the simplest one) is barely using the RT cores, and gets less than a 10% speedup. Scenes with heavy instanced geometry with dense foliage and scatter nodes seem to get into the 3-4x range, even for path tracing. 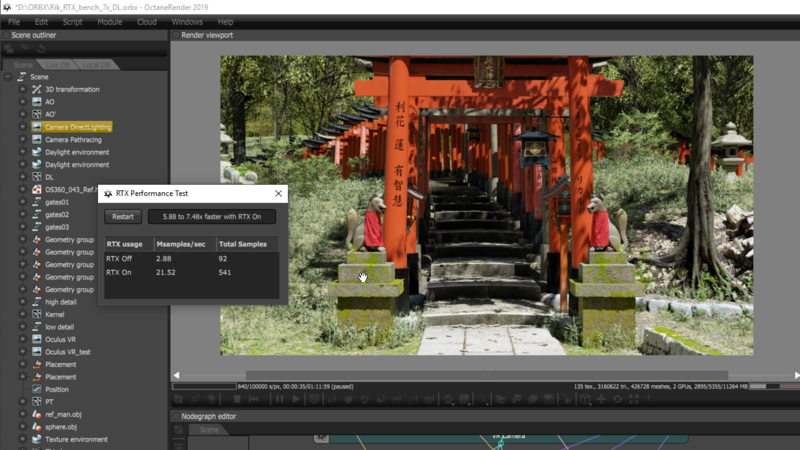 Further optimizations are planned to bring as much of the maximum possible 6-7x+ RTX speed up to more and more scenes like the Japanese garden. Q: How do I know my GPU is using hardware for ray tracing acceleration? A: Make sure RTX acceleration is enabled in File > Preferences > Devices Tab > Use RTX acceleration (experimental). RTX acceleration will be enabled automatically for all devices which support RTX hardware acceleration, currently the NVidia Turing GPU range. Q: Does this work with GTX cards? A: It will work but you won't get any speedup due to RTX. Note that even though some older devices claim to support RTX this is software only, in this case the regular Octane ray tracing backend will be used as usual as it does not provide any performance improvements based on our experience. Q: Will you release Linux or OSX builds? A: We can release them as soon as NVIDIA provides with suitable drivers, no ETA for that at the moment. 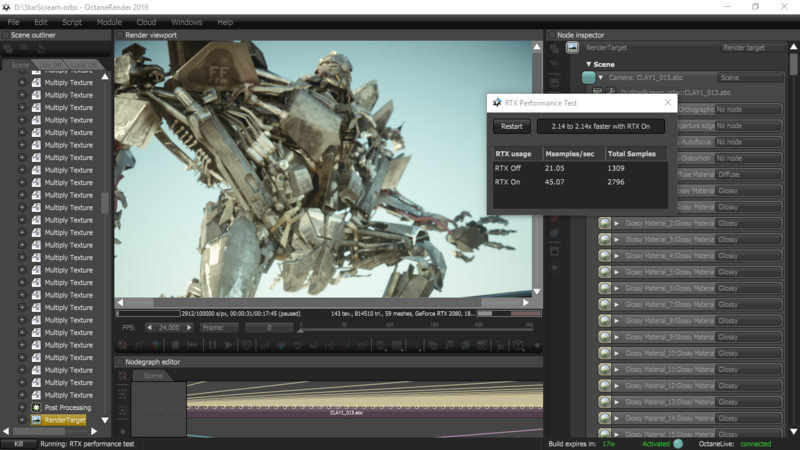 Q: When will a stable version of Octane with full RTX support be released? 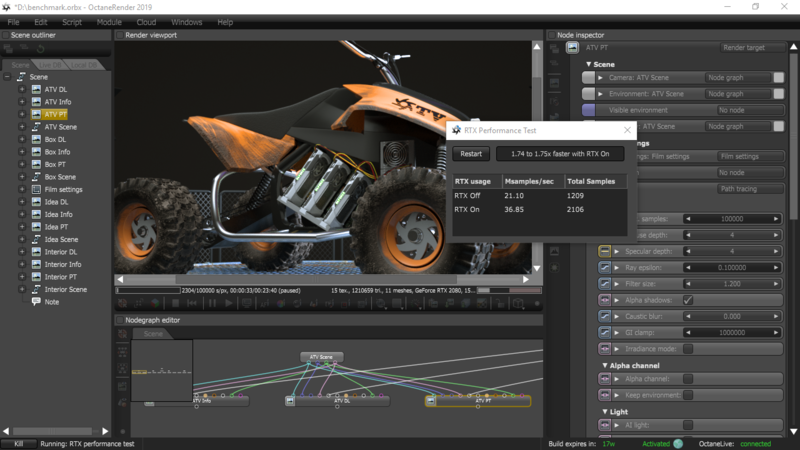 A: RTX support is currently planned as feature in Octane 2019 (with a first integration coming in 2019.2). Q: What performance boost should I expect? A: That depends heavily on the scene, we've experienced speedups of up to 7.5x in some scenarios, and less than 1.1x in others. RTX speed up will be lower in scenes with heavier shading relative to smaller geometry complexity and density. 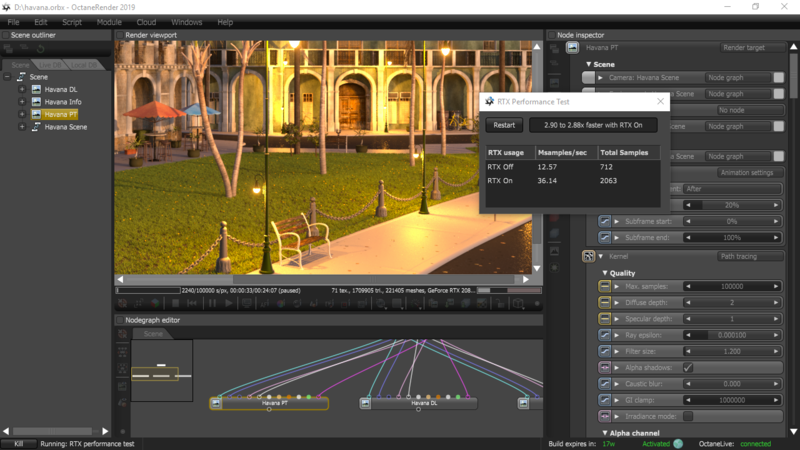 Q: Does this new technology affect the quality of the final render? 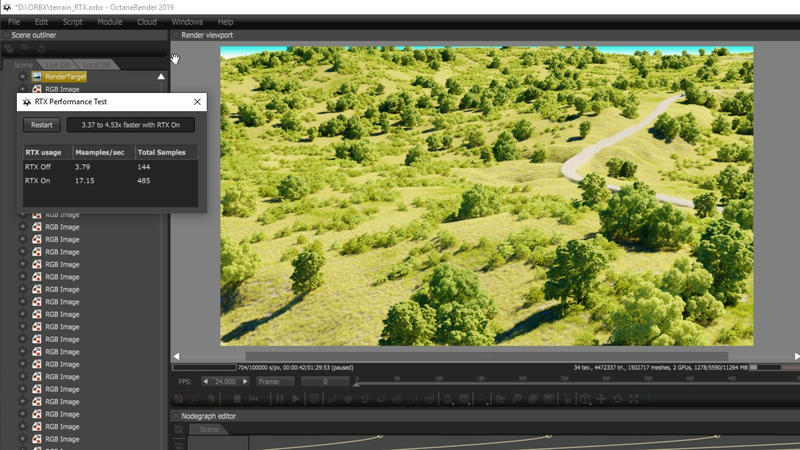 A: Although it is not directly related to the final quality of your render, using hardware acceleration for ray tracing translates into faster render times so you can render more samples and get a cleaner image in the same amount of time as before. Otherwise RTX on mode looks the same as RTX off (if it doesn't please report this as a bug). Q: Do I need to install the Windows 10 October 2018 Update for this to work? A: No, however the required drivers may require you upgrade to version 1803 (April 2018 Update). Windows (64-bit) 7 (SP1), 8 or 10 (1803). NVIDIA graphics card (CM 3.0 or higher, CM 7.5 is required for RTX support). This build will expire in 120 days. Only mesh triangle scene geometry is supported in this release. RTX optimized versions for dirt, rounded edges and displacement are in progress, but not yet in this build. Motion blur is not enabled. Pick and autofocus functions are disabled. Network rendering is not supported. Please test your scenes and let us know the results on the comments below. Thank you! Last edited by Goldorak on Wed Mar 20, 2019 6:01 am, edited 1 time in total. Re: OctaneRender RTX | Vulkan - preview release is out! Wow! PMC tests soon, if GPU usage are 95% or 99%/100%? HDDs 1TB SATA2 and 3TB SATA3. So the way I'm reading this is that if you have a mix of rtx and gtx cards, you either have to choose to use them all on the old cuda method or waste the gtx and only run on the rtx to get the benefit of rtx? Or can it run rtx on rtx cards while running old cuda on the gtx in the same render session? snakeboxmedia wrote: So the way I'm reading this is that if you have a mix of rtx and gtx cards, you either have to choose to use them all on the old cuda method or waste the gtx and only run on the rtx to get the benefit of rtx? Or can it run rtx on rtx cards while running old cuda on the gtx in the same render session? 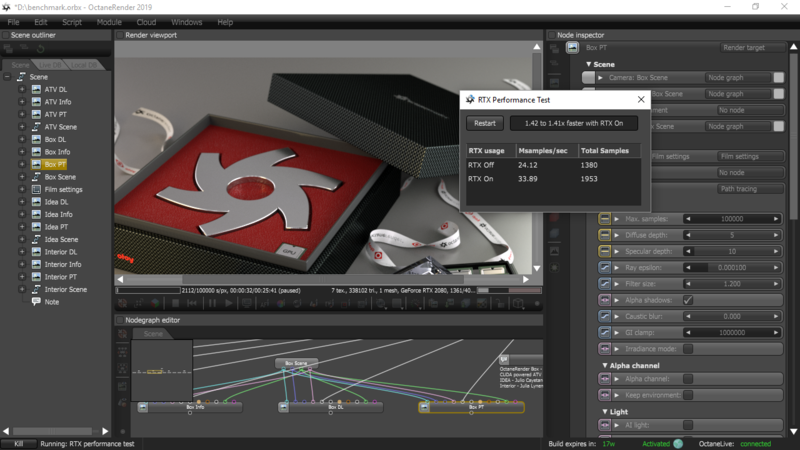 Octane automatically uses RTX HW acceleration for those cards that support it and the regular tracing method for GTX cards, so if you have a mix so you don't need to compromise anything and will be able to use all available resources. When RTX OctaneRender 2019 Subscription Version will be able for downloading? lanklaf wrote: When RTX OctaneRender 2019 Subscription Version will be able for downloading? Soon as it is ready, no wait for users on monthly or annual plans. I have just seen the 2019.2 video materials. What about the "Anime Kernel" that have been shown in the previous video announcement material ? I got a 12.5 times boost from RTX on one of my scene (with a 2070). Unfortunately the RTX-render looked different then de none RTX-version. It looked like SSS was behaving differently. I tested the RTX benchmark with an RTX 2070, but in every test so far RTX ON was not faster at all. It seems not to work at all. Sometimes a mere 1 percent and sometimes slower. 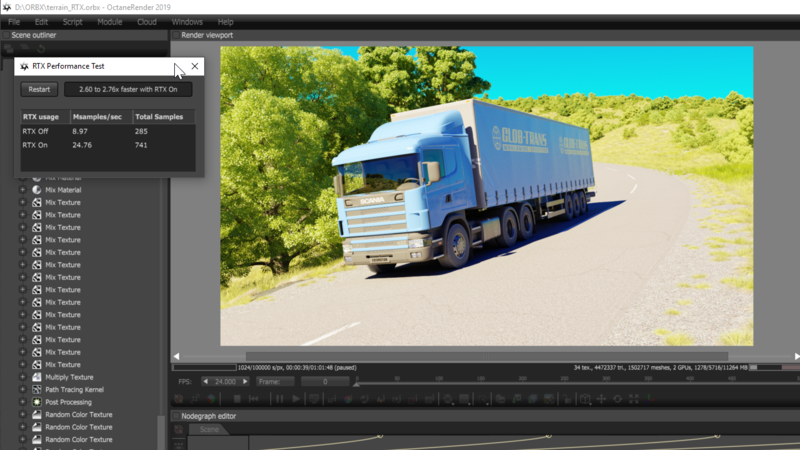 I tested with Havana and some custom scenes exported from C4D R20. Also the benchmark released a couple of weeks ago didnt detect the gpu as an RTX gpu. I know for sure that RTX is working in games so it must be a driver/octane problem. PolderAnimation wrote: I got a 12.5 times boost from RTX on one of my scene (with a 2070). Unfortunately the RTX-render looked different then de none RTX-version. It looked like SSS was behaving differently. If this specific scene includes any of the features currently in the list of limitations this may be causing the difference you see. We might update the script to automatically update your scene to remove unsupported features for the test but you may want to take a look at that before this happens.